WASHINGTON, D.C., December 18. THE National Aeronautics and Space Administration (NASA) is currently running a poll to discover what Top 10 NASA-Related Stories made the most impact this year. NASA know-how helped swimsuit designers create a body suit worn by an assortment of gold medalists and world record holders at the 2008 Summer Olympics in Beijing. Among the medalists wearing Speedo’s LZR Racer were Americans Michael Phelps — winner of more Olympic gold medals than any athlete in the modern era — and Natalie Coughlin. Aerospace engineer Steve Wilkinson at NASA’s Langley Research Center in Hampton, Va., played a role in developing the swimsuit by testing dozens of fabrics in Langley’s 7-by-11-inch low speed wind tunnel. Warnaco Inc., the U.S. licensee of the Speedo swimwear brand, approached Langley to test fabric samples because the NASA center has researched drag reduction for aircraft and boats for decades. Just as reducing drag helps planes fly more efficiently, reducing drag helps swimmers go faster. 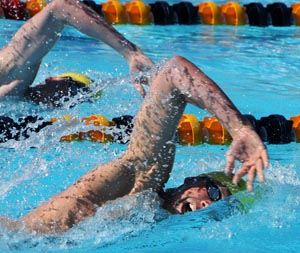 Studies indicate viscous drag or skin friction is almost a third of the total restraining force on a swimmer. Wind tunnel tests measured the drag on the surface of the fabrics. Speedo’s research and development team, Aqualab, took the results and used them to help create advanced “space-age” swimsuit designs. 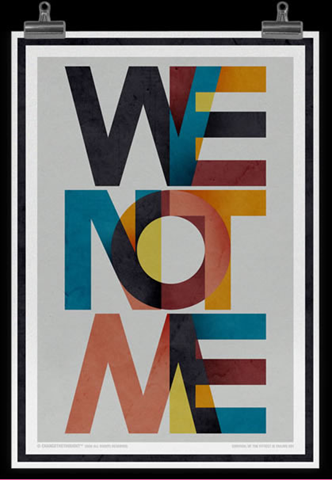 The interesting thing about this poster that hit my eye is the quote “We Not Me” … In this “ME” generation it ask’s us to think as a team and not as an individual. To work together for the betterment of the team.It also shows us that if you work together you can achieve your goals along the way. Nothing made me feel better as a Coach, when I would hear one swimmer encouraging another swimmer in their lane to work harder, it is a quality that now days is rare. Maybe this New Year you can start using this poster as a inspiration to think as “WE”….Together you can achieve!! !